If I do say so, the year-long visioning project had gone well. More than 800 citizens participated in 12 visioning sessions, collectively generating more than 4,000 ideas and images of what they would like their community to be. Working with a planning group drawn from those who participated in the visioning sessions, we boiled down those ideas into 14 strategic objectives, 27 specific recommendations and 173 action steps. It was the greatest act of citizen engagement and planning the community had ever undertaken, and its sponsors were delighted with the results, which were ambitious, affirming and specific. I fumbled for an answer, saying something about creating groups to take charge of the most promising ideas, but I had two thoughts in the back of my mind. The first was that I was in the visioning business, not the implementing business. Thankfully, I didn’t say that. My second thought was one of surprise: You mean even smart and experienced community leaders don’t know how to get things done? Thankfully, I didn’t say that either. It hit me as I drove back to Atlanta that I needed – and she needed – a theory of community change, one simple enough to fit on a sheet of paper but which fully describes the way complicated and diverse communities make up their minds to do something different – and get it done. In the years since, I’ve sketched and resketched multiple versions of that theory. I tried first expressing it as a formula, kind of like E=MC². Then I tried doing it as a step-by-step process. 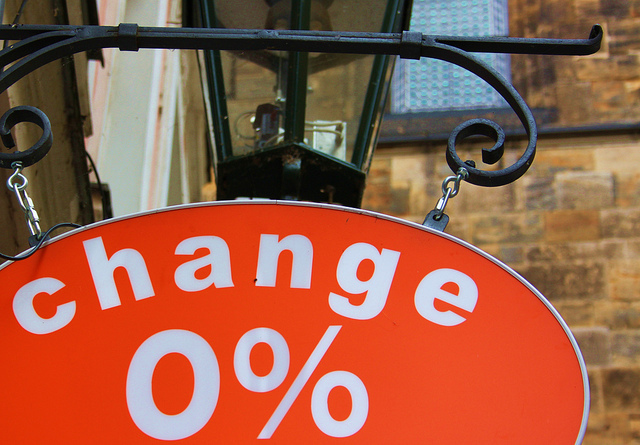 (I had been influenced by John Kotter’s eight-step process for corporate change.) Then I tried various ways of drawing flow charts. 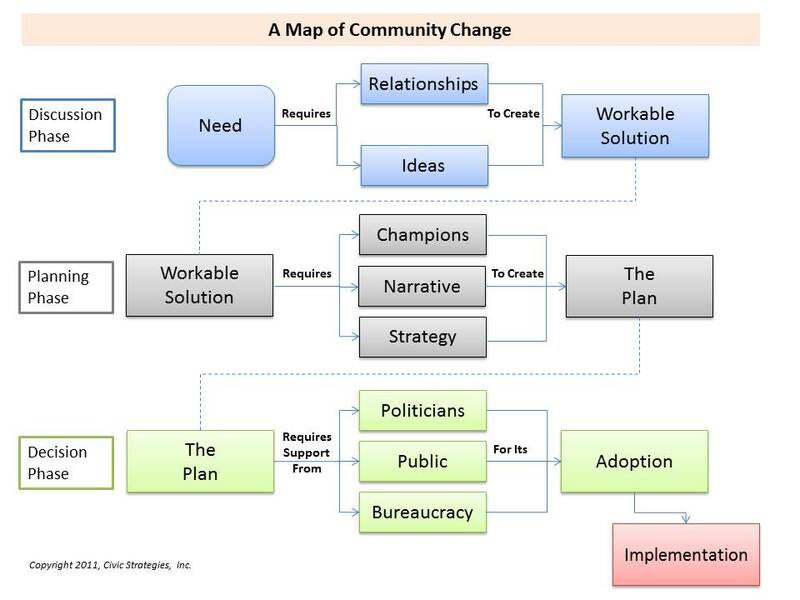 The problem, I quickly realized, wasn’t in how I represented the process; the problem was that it was hard to capture all the elements of community change and still keep it simple enough to be useful. In the next few postings, I’ll explain different parts of the map. For the time being, though, take a look at the three horizontal “phases” – discussion, planning and decision. Community leaders, I think, concentrate too much on the first and third phases (the blue and green areas) and not nearly enough on the gray area in the middle. And it was this area that the business leader was asking about: How do we use an engaged group of citizens to prepare challenging ideas for public acceptance and government action? Again, I’ll talk about the phases in detail in the coming weeks, but let me offer three general thoughts about the map: First, the most successful mayors, chamber executives and community leaders I’ve ever known carried a map like this around in their heads. They knew how long it took to travel from realizing a need to making a decision (and even longer to implementing the decision), and they knew that most ideas didn’t survive that journey. But for those that did, this was the road they traveled. 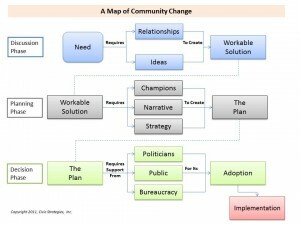 This is the first of a series of postings about mapping community change. Photo by Mark Deckers licensed under Creative Commons. You are anticipating my future postings. I’ll have a great deal to write about each of the phases, but I’ll focus in particular on the gray area, which is where I think ideas succeed or fail (that is, with a big helping of luck on the side). I’ll define “workable solutions” and “the plan” along the way. And importantly, I’ll also talk about what the three decision-making arenas (politicians, public, bureaucracy) require for their support. In doing so, I think I can distinguish between what we typically call “plans” and what I have in mind for “the plan”. So stay tuned. You’ve made a very important addition, though, in pointing out that real life (and real communities) are messier than maps. The map shows an orderly sequence of steps. In fact, real communities are full of backtracking, redos, obstacles and start-overs. It’s possible, for instance, for a successful proposal to begin with a set of champions who launch the discussion phase in hopes of generating ideas and relationships that can produce a solution. (This isn’t all that odd; in fact, it’s how most visioning projects come about.) And while the map shows the decision phase as having the politicians, public and bureaucrats reaching agreement at roughly the same time, it rarely happens that way. So, yes, please keep in mind this is a highly simplified model of how decisions are made in communities. For leaders in real cities and towns, I should include this warning: Some assembly (and reassembly) required. P.S. The map also doesn’t account for bad ideas. So you could use this map to promote a really bad idea. But since the odds are so stacked against ideas involving substantial change and some cost, I’ll focus just on the good ones for now … since those are the ones I’d most like to assist. Perhaps in the future, though, we can take a look at how to defeat bad ideas.